Geneious solutions are used all over the world. Small biotech start-ups, large pharmaceutical organizations, niche academic groups and everyone in between use Geneious to optimize sequence data management, encourage consistency and collaboration, and speed up analysis. Enterprises involved in therapeutic antibody R&D are choosing Geneious Biologics to probe reams of antibody sequence information quickly and accurately, in order to narrow the search for successful candidates and innovate faster. Geneious Biologics is fully interoperable with Geneious Prime. Seamless cloud integration allows users to transfer sequence data in real time from Geneious Biologics to Geneious Prime and vice versa, simplifying the transfer of NGS antibody data for downstream processing. Minimizing the need to export NGS and assay data between applications removes a significant data management challenge and lessens the risk of data loss. Workflows managed on the Geneious Biologics cloud platform are logged and traceable, streamlining the flow of antibody NGS data across the entire drug discovery process. Consolidating antibody research data in the cloud also simplifies the traceability of information, an important consideration in protecting critical IP. Organizations working in a wide range of sectors, such as pharma, diagnostics, and agroscience, use Geneious Prime to improve the efficiency of research teams and unlock the value of sequence data. Geneious Prime’s superior interoperability, including as an API, plugin development, and the ability to create workflows means the science can get done faster. 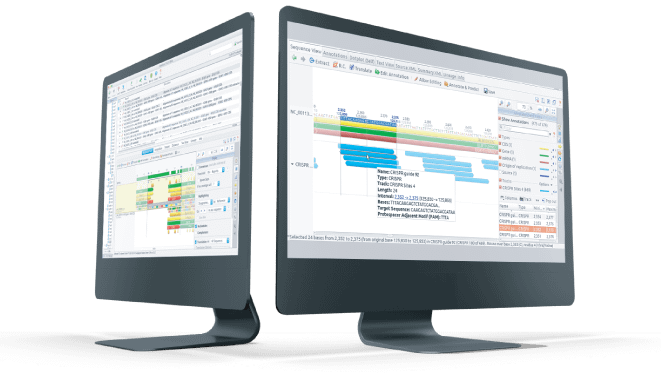 Centralizing sequence data management and analysis reduces confusion among teams, and maximizes the benefits of collaboration. Geneious Prime offers the widest range of analysis tools on the market. Easy molecular cloning applications are up to date with industry trends, and tools such as assembly, alignment and BLAST searching, and more are all available in one comprehensive suite. The intuitive design of Geneious Prime is quickly picked up by users, reducing the time required to train teams. Students, academics, and government professionals can take control of their sequence data and discover valuable insights. Geneious Prime’s reputation for empowering science has made it the most-cited sequence analysis and management software in the world. Geneious Prime plays an integral role in a multitude of research disciplines, due to the comprehensive nature of its operations. A vast range of data types, including NGS, can be simply imported or converted, allowing scientists to take advantage of new sequencing techniques and maximize the value of older data sets. Phylogeneticists can align sequences and build trees using the best peer-reviewed algorithms. Cloning strategies can be designed ahead of wet lab work. Genomes can be annotated and variants detected with powerful tools. Sequences can be aligned and assembled with ease. Geneious Prime is a great tool for teaching the basics of many disciplines, as it provides a visual touchpoint for learners.